Māori customary law, parts of the Magna Carta and ordinances made by long-gone provincial governments are all part of the law of New Zealand. Despite much of the legal system being inherited from Britain, New Zealand has a history of innovation in law. Until 1840 the law in New Zealand was Māori customary law. This law is still recognised in New Zealand if it meets certain criteria. New Zealand’s legal system was founded on British law, but it has evolved into a separate system. International law and treaties have influenced New Zealand law, especially since the 1960s. New Zealand has common law, which means judges make legal decisions based on previous judges’ decisions as well as on statutes (written law) passed by Parliament. Criminal law is one of two broad parts of New Zealand law (the other being civil law). For something to be a crime in New Zealand it must be outlawed in a statute. Verdicts for serious criminal offences can be decided on by a jury – 12 members of the public who have been selected randomly. New Zealand removed the death penalty for murder in 1961, and for treason in 1989. The other part of New Zealand law is civil law. This deals with disputes between individuals or organisations. other specialist courts, including the Family Court, Environment Court, Māori Land Court, Employment Court and Youth Court. There are also various tribunals which deal with particular areas of law. Alternative dispute methods such as mediation are increasingly used. New Zealand has around 200 judges who decide on court cases. Judges are independent from the government, which is important for a fair justice system. The head of New Zealand’s judiciary (judges) is the chief justice, who presides over the Supreme Court. 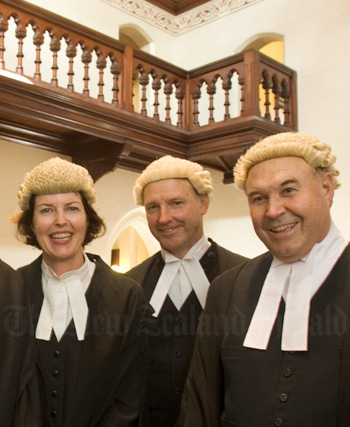 In the early 2000s there were more than 11,000 practising lawyers in New Zealand. Most were both barristers (who work in courts) and solicitors (who give legal advice). Lawyers must have a law degree and must pass a professional training course. The Law Commission is an independent agency that makes recommendations to the government on law it believes needs to be reviewed and suggests legal reforms. Even though much of New Zealand’s legal system was inherited from Britain, it developed some unique features. For example, there is a universal accident compensation scheme. This avoids the need for court action to gain compensation for injuries caused by accidents. The Waitangi Tribunal is a unique institution where Māori can take complaints about breaches of the Treaty of Waitangi, which was signed by Māori chiefs and the British Crown in 1840. The Tribunal makes recommendations to the government. There are various independent authorities people can apply to for a legal review, including the Office of the Ombudsmen, the Independent Police Complaints Authority, the Human Rights Commission and the health and disability commissioner. There is also the option of applying for a judicial review, where judges review whether a government action is legal.